Dr. Christine E. Haycock, distinguished surgeon and leading expert in sports medicine for women, was born in Mt. Vernon, NY and raised in Richmond, VA and then in Nutley, NJ. Following high school, she attended the Presbyterian Hospital School of Nursing and earned a bachelor’s degree from the University of Chicago. She was an outstanding athlete in her youth, participating in the US fencing squad for the Olympics in the late 1940’s and as a softball pitcher with several top teams. 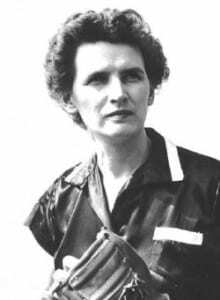 Before becoming a surgeon, Dr. Haycock served in the army during WWII in the US Cadet Nurse Corps, earned her medical degree from the State University of New York in 1952, and went on to become the first woman intern at Walter Reed Army Medical Center. She also had a master’s degree in political science from Rutgers University and was a graduate of the US Army Command and General Staff College and the US Army War College. After many years in the Army Medical Corps, she retired in 1984 from Active Reserve Status at the rank of colonel, having earned two Commendation Medals and a Meritorious Service Medal. Her service as commander of the Army’s 322nd General Hospital paved a way for women to serve in the military, and even more so as a medical practitioner. Following active duty in WWII, Dr. Haycock completed her surgical residency in New York before returning to Newark, NJ where she opened a private practice in general surgery. She joined the faculty of the New Jersey Medical School as associate professor of surgery and director of emergency services in 1968 and helped establish the trauma center at University Hospital in Newark. In addition to her work on eradicating uterine cancer, she was a leading expert in sports medicine (particularly women in sports). She served as president of both the New Jersey Medical Women’s Association and the American Medical Women’s Association. Outside of medicine, Dr. Haycock found time to be a photographer, videographer, amateur radio operator and dog breeder. She was elected to Fellowship in the Photographic Society of America. In 2004, she was awarded the Alma Dea Morani Renaissance Woman award by The Foundation for the History of Women in Medicine. She was married to Samuel Moskowitz, a noted science fiction historian.